Opening Reception Friday April 19th, 2013. 7-10pm. Chris Lux is a painter and sculptor from San Francisco. Lux’s practice, which has taken shape as a series of paintings and sculptures, investigates the history of objects, time periods and people, and his own history as an artist. In his new show at Park Life, painted frames, tables and ceramics, speak to a shared idea of arts place in daily life. Lux’s work draws subject matter from the past, most notably, from the world of Mythologies. His most recent book “12 Saints” with writer William Rockwell, drew exclusively from hagiographies of the lives of Christian saints taken from “The Golden Legend” (Jacobus de Voragine, c. 1260). In his new works, Ancient Mythologies from Japan have taken center stage . The works speaks in the language of painting and composition to not only tell this stories from the past, but also the story of his own practice as an artist. Playing with three distinct styles, black and white illustrate works, crisp bright colored graphic work, and funky dripping ceramic works, they are used interchangeably to speak of stories from the past. This self referential sampling from the artist own past works and styles, keeps the work from being simply illustrative, and adds a level that speaks of the myth making of artists own careers. Lux is represented by Jancar Jones Gallery in Los Angles. 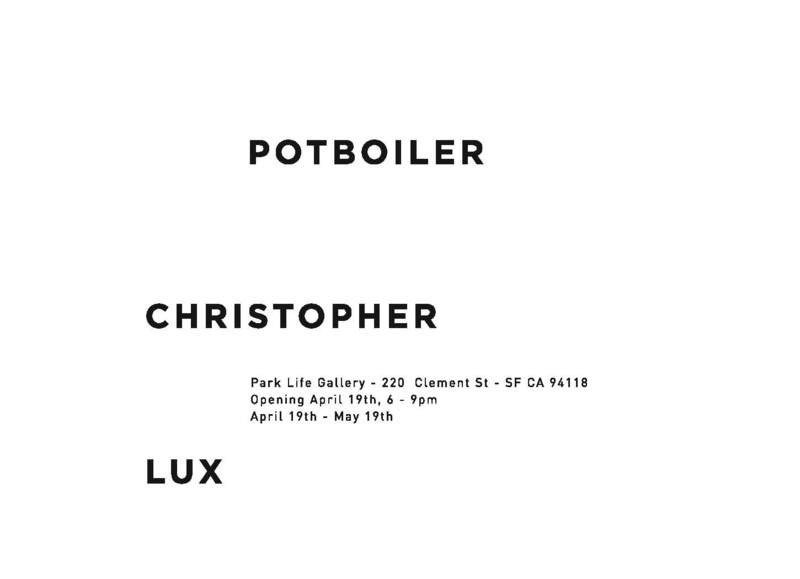 His most recent show has been “Eating out of the Drain”, at The Popular Workshop in San Francisco. He has shown extensively in the US and Europe.